At Mollner Dentistry, we are capable of handling nearly every facet of dentistry from cleanings and fillings, to crowns, root canals, extractions, surgery, Invisalign, implants, whitening, Botox, and cosmetic dentistry. We have 4 doctors on staff who each have their own unique talents in dentistry: If you need a specific procedure, we can align you with the doctor who is the best fit for your problem. ce, and who continue their training every year. Typical patients in good health will usually see our hygienist first for a new patient cleaning and radiographs. 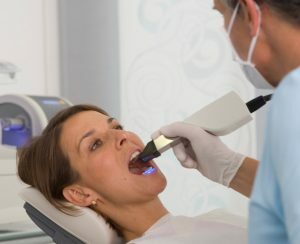 As part of the cleaning, the doctor will complete a comprehensive exam of the entire mouth, and evaluate radiographs. If further treatment is necessary, we will develop a prioritized plan and give you cost estimates before you leave. Our hygienists are excellent with “deep cleanings” (Scaling and Root Planing) if your gum tissue is less healthy than usual. They make the process comfortable and implement technology to make your visit a pleasant one. We use completely digital radiographs (X-rays) which allows for major reductions in radiation, as well as instant processing. The images show up on a computer in front of the patient live as they are captured. The doctor will review your radiographs in full resolution with you, along with high resolution photographs so that you are fully aware of the diagnostic process. “SoPro” intraoral camera using fluorescent light to display cavity in red. Green is healthy tooth structure. We are a Premiere Provider for Invisalign treatment, meaning we complete a high number of Invisalign cases annually. We have remained among the top of the list for most cases completed by a general dentist in Colorado since 2013. Invisalign is an orthodontic treatment for straightening teeth using thin clear trays instead of metal brackets and wires as with traditional braces. It is the most comfortable, esthetic, and efficient method of moving teeth. The average Invisalign case finished approximately 30% faster than the same case with metal braces. 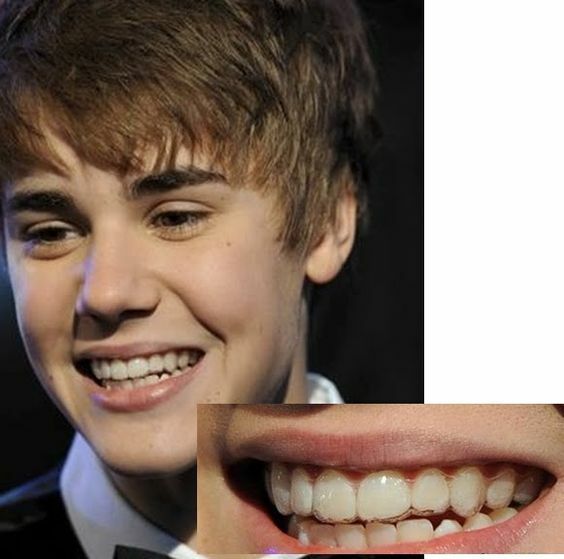 Biebs wearing Invisalign trays on the red carpet. We use only BPA-free and mercury-free white composite filling material in our office. This material is very easy to polish and make look like natural tooth structure. It is also very forgiving for adjustments or additions if necessary in the future. At Mollner Dentistry, we take particular pride in our crown service. Teeth that require stronger restorations, or teeth that are fractured – are good candidates to receive a crown – a strong, porcelain shell that surrounds your natural tooth. 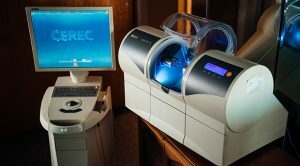 We have invested in two Cerec crown milling machines. This allows us to prepare and make a crown while you wait. 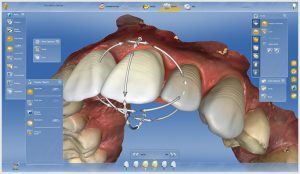 The process also allows us to skip gooey impressions and use our 3D laser scanner to take digital impressions. Digital impressions result in accuracy down to 6 microns (the width of a blood cell). The old method for making a crown required a putty impression and a temporary crown to be placed while the lab made the final crown. 2 weeks later, the dentist would swap the temporary crown for the final crown. 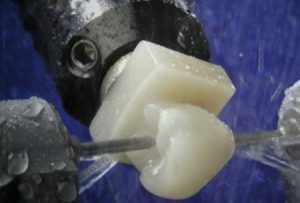 Now we take a digital impression, and our Cerec mill cuts the final crown from a solid block of porcelain in 30 minutes. The final product is an extremely strong, and highly esthetic crown that is cemented on the tooth the same day with no temporary. 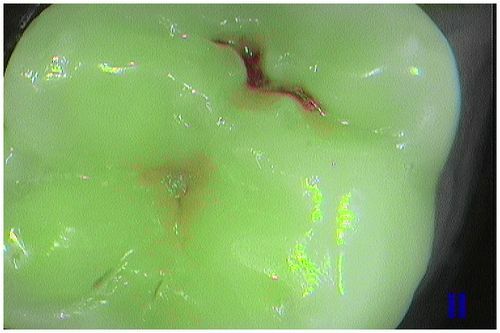 Final crown cemented where large silver filling previously existed.